Math is a very important subject. What do you want to be when you grow up? No matter what your answer is, you will need math to do it right. Some jobs use tougher math than others, but they all start with learning the basics. The first step to learning math is learning your numbers. It really is as easy as 1, 2, 3! Once you know all the numbers, at least from one to ten, you can learn how they work. School usually starts with addition first. Addition helps you learn when you have more of something. For example: you had one cat but then it had three babies. How many cats do you have now? Subtraction is the opposite of addition. With it, you learn how to take a number away from another one. For example: you have six pieces of candy but then you give one to your friend Biff, one to your friend Melanie, one to your friend Christina and one to your friend Paul. How many pieces of candy do you still have? It is also important to understand math as it relates to time and money. How do you know if you have enough money left over from lunch to buy a snack? Do you know how many hours are in the school day? How long from now is the weekend, or summer vacation? The answer to these questions can be found with math! 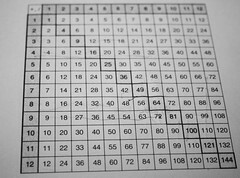 Multiplication is a very helpful tool, but you need to know how to use it. It involves adding a bunch of the same number all at one time. Here is an example: there are seven students in the library and they each take out three books. How many books were taken out of the library in total? This would be an important question that a librarian would need to know the answer to. After multiplication you will learn division. A real life problem that division can solve would sound something like: If there are twenty kids in your class and your teacher splits you up into teams of four, how many teams would there be? Once you learn division, you might be ready to study fractions. Fractions look like numbers on top of numbers. They represent an amount that is smaller than one. For example, a quarter is ¼ of a dollar. After fractions you will learn decimals. Decimals are like fractions because they represent a part of a whole, but they are very different in the way that they are written. A decimal looks like .12 or .05. Whatever grade you’re in, there are games on the Internet to help you build your math skills. Below are some games for you to try out. To make them even more fun, they all have animals in them! The games at the top of the list are for kids in Kindergarten, while the ones near the end of the list are made for fifth graders. Next to the name of the game is the type of math the game will help you practice. Find the one you need help with, have fun and learn! Get the latest class invites delivered straight to your inbox. Our main focus is to help people reach their investing goals whether it's capital preservation, wealth creation, or simply taking control of their own lives through financial security. © 2019 OptionsANIMAL. All Rights Reserved.